When the Grand Lodge of Texas, on the afternoon of December 2, 1954, installed Brother George Moffett of Chillicothe, Texas, as Grand Master for the ensuing year, it extended recognition to the large number of Brethren in the northwestern part of Texas. Brother Moffett is a native of that region and resides further from the permanent headquarters of the Grand Lodge than any other Grand Master who has ever served from that large and expanding area. His parents, Frank L. and Ina M. (Farrington) Moffett, each came to Hardeman County in a covered wagon in the late 1880’s, the pioneer days of that region. They were married on December 27, 1894, and celebrated their 61st wedding anniversary on the same date in 1955. Their only son, George, was born on a ranch near Chillicothe, Hardeman County, Texas, on November 20, 1895. He attended one-room rural schools for six years; graduated from Chillicothe High School in 1911; sought further high school training in Chico, Wise County, Texas, and was graduated with honors in 1912; attended the A. & M. College of Texas, and was graduated with a Bachelor of Arts Degree in Agriculture in 1916. 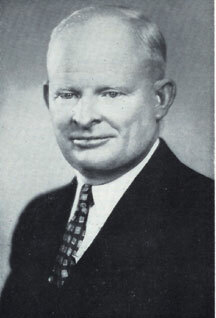 He served in World War I in the Infantry and Air Service, was engaged in retail business in Wichita Falls and Graham, Texas, during 1920-23, and since that time, has resided at Chillicothe, Texas, where he has managed his father’s farming and ranching interests and is considered an outstanding thinker on agricultural problems. In 1930 Brother Moffett became a candidate for the House of Representatives in the Texas Legislature, was elected and served eight years in that body, and was then elected a member of the State Senate, a position which he has held until the present time. His service in the Texas Legislature embraces a longer period of years than the service of any other individual who has ever been a member of that body. He has been a leader in agricultural legislation and has vigorously espoused the principle that, expanded and increased scientific research for new markets for agricultural products is the fundamental key to the solution of many agricultural problems. He has been the author of numerous bills for the benefit of the veterans of both World War I and II, and is the author of more amendments to the Constitution of Texas than any other member of the Legislature, past or present. Initiated-December 9. 1916; Passed-January 13, 1917, and received the Master Mason Degree on February 12, 1917, in Chillicothe Lodge No. 876, Chillicothe, Texas. Worshipful Master of Chillicothe Lodge No. 876, A. F. & A. M., 1926-27. District Deputy Grand Master of the 90th Masonic District in 1928. Member of Chillicothe Chapter No. 319, R. A. M.-since February, 1917. Member of Chillicothe Council No. 255, R. & S. M.-since February, 1917. Member of Vernon Commandery No. 33, Knights Templar-since April, 1917. Charter Member of Maskat Shrine Temple, A.A.O.N.M.S., Wichita Falls, Texas-1920. Member of Prairie Gem Chapter, O. E. S., Chillicothe, Texas-since 1917. Member of Dallas Scottish Rite Consistory, A. & A. S. R.-since 1945. Member of St. Timothy Conclave No. 65, Order of Red Cross of Constantine-1952. Grievances and Appeals No. 3-1943. Masonic Education and Service-1946-47. He has filled the following Grand Lodge offices: Grand Tiler-1945. Grand Junior Warden-1952. Grand Senior Warden-1953. Deputy Grand Master-1954. Grand Master-1955. He is the Grand Representative of the Grand Lodge of South Dakota near the Grand Lodge of Texas. In 1953 he was chosen by the Supreme Council of the Scottish Rite to receive the rank and decoration of Knight Commander of the Court of Honour. Brother Moffett has always been active in civic, church, and political activities and became a member of the Methodist Church while a college student and has served as a trustee of the Chillicothe Methodist Church for more than fifteen years. He is a charter member and the first president of the Chillicothe Lions Club and later Deputy District Governor of District 2-E.
On August 1, 1933, Brother Moffett was married to Miss Hilda Rabb of Fort Worth, Texas. To this union two children were born, Patricia Joy and Frank Lee, both of whom are now college students. Brother Moffett has always had an inclination to preserve and profit by the lessons of history, of which he is a constant student. In line with this inclination, he espoused the expansion of the Grand Lodge Library and Museum as one of the principal objectives of his term as Grand Master. His efforts have produced unexpectedly successful results in that a very large number of peculiarly fitting and appropriate museum items have been placed in the Grand Lodge Museum during his term as Grand Master. Likewise, the Library has been materially enlarged with volumes of a Masonic, historical, inspirational, and educational nature-both ancient and modern.